We all know that the world of sales moves at a fast and furious pace. So what should you do when your prospective customer poses difficult questions? Questions that we possibly don’t even have the answers for. It’s in those situations that pressure builds quickly. We want to avoid a faux pas or moments of hesitation that can cause us to draw a blank and put us at risk of losing our sale. Not to worry. 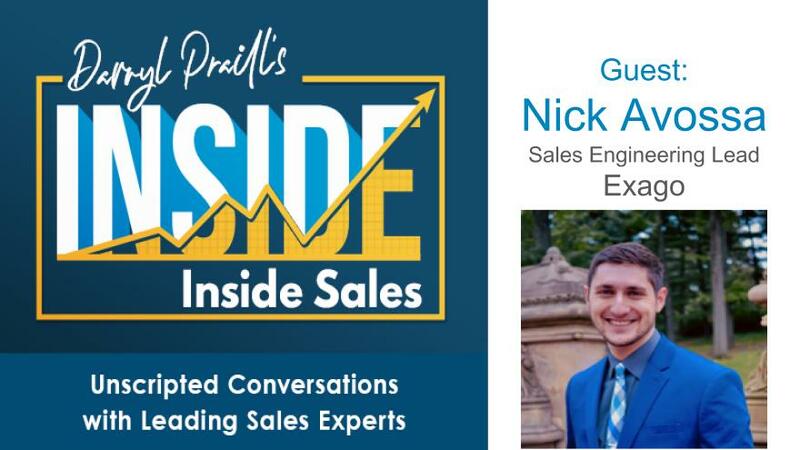 Nick Avossa from Exago joins Darryl on the podcast to discuss just what to do should you ever encounter those difficult questions. Nick Avossa joined Exago in October 2015, and is currently the Sales Engineering Lead. His team is responsible for supporting the Sales and Marketing departments in the pre-sale journey, while providing the best experience possible during product evaluations. Juggling internal projects, moonlighting as a SalesForce admin, and helping to aggregate feature interest for the Product Development team, are just a few of the things that keep Nick busy at Exago. When free of the cubicle walls, Nick enjoys outdoor running, even in the coldest months of the year. He’s looking forward to warmer weather as he takes on the Charleston Cooper River bridge run at the start of next month.